The SNP will pledge a return to free university education as part of its election campaign drive next year. 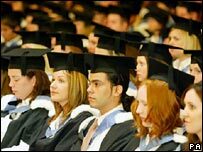 The party will say a £100m package for students will mean an end to the graduate endowment fee. Student loans would also be abolished and there would be a return to the system of grants, the SNP will say. Deputy leader Nicola Sturgeon will deliver a keynote speech this week on the policies a Nationalist government would deliver if elected next May. She claims that current education policies are holding back the country's younger generation. Ms Sturgeon said: "This package will get rid of the graduate endowment, the backdoor tuition fee, to make university education free again. "It will also abolish student loans and replace them with grants and it will allow for the write-off of the existing graduate debt from student loans that holds so many young people back from taking entrepreneurial risks and getting on the housing ladder. "The SNP is determined to create a generation that is independent of mind, confident and forward-looking."